Q1. What is a Drop ship PO? A: Oracle Order Management and Oracle Purchasing integrate to provide drop shipments. Drop shipments are orders for items that your supplier ships directly to the customer either because you don’t stock or currently don’t have the items in inventory, or because it’s more cost effective for the supplier to ship the item to the customer directly. Drop shipment was introduced in R11. Q2. How is a Drop Ship PO created? A: Drop shipments are created as sales orders in Order Management. The Purchase Release concurrent program or workflow in Order Management creates rows in the Requisition Import tables in Purchasing. Then Purchasing’s Requisition Import process creates the requisitions. Drop shipments are marked with the Source Type of External in Order Management and Supplier in Purchasing. Q3. What is the setup required for Drop ship PO? All Drop Ship items must be defined in the organization entered in the profile option OE: Item Validation Organization and in the Receiving Organization. All drop ship sub-inventory must have Reservable box checked. If the sub-inventory is not Reservable the sales order issue transaction will not be created in MTL_TRANSACTIONS_INTERFACE. After drop ship inventory organization is created, subinventories should be defined. To create the subinventory, go to an inventory responsibility and navigate to Setup -> Organizations -> Subinventories. Asset subinventories must have the reservable and Asset boxes checked. Expense subinventories must have the Reservable box checked and the Asset box unchecked. Q4. How can we avoid the miscounting of supply as logical organization is involved? 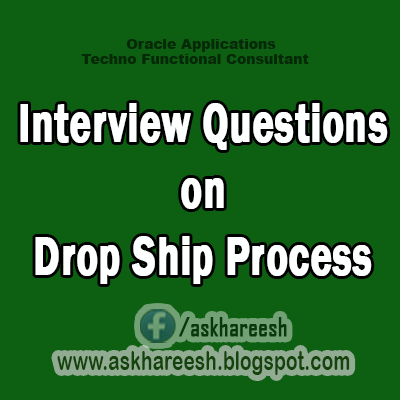 A: You must receive drop-ship items in a logical organization. If you use Oracle master Scheduling/MRP and Oracle Supply Chain Planning, to avoid miscounting supply you may not want to include logical organizations in your planning. If you choose to include logical organizations, ensure that doing so does not cause planning and forecasting complications. Q5. If you make changes to a sales order after the Purchase Order (PO) has been generated, will the order changes automatically be updated on the PO? A: Order changes will not be automatically updated on the PO. Pulling up the Discrepancy report will allow you to view the differences between the Sales Order and PO. However, you will have to manually update the POs in the Purchasing application. Q6. If items on a Drop Ship order are cancelled, does the system automatically generate a PO Change to the PO originally sent to the supplier? A: No, Drop Ship functionality in this regard remains the same as in R11. There is a discrepancy report available that will report differences between the PO and the Sales Order. Q7. Does Order Management 11i have functionality to do serial number management with Drop Shipments? A: You are able to receive serial numbered Drop Ship stock. Order Management will receive the serial number noted on the PO. Q8. Can Configurable Items be drop shipped? A: Currently only Standard Items can be drop shipped. Functionality for Configurable Items will be added in future releases. Q9. How do I drop ship across operating units? A: Release 11i does not currently support this functionality. Q10. How are over/under shipments handled in drop shipment? A: If part of a drop-ship line ships, and you do not wish to fulfill the remaining quantity, cancel the line. Over shipments must also be handled manually. If the supplier ships more than the ordered quantity, you can bill your customer for the additional quantity or request that they return the item. Use the Drop Ship Order Discrepancy Report to view differences between your drop-ship sales orders and their associated purchase requisitions and orders. Q11. Will Blanket PO's work with Drop Shipment? A: Blanket PO's will not work with Drop shipment because the PO must be created when OMnotifies PO that a drop ship order has been created. This PO is linked to the drop ship order so that when the receipt is done (partial or complete) .OM is updated to receiving interface eligible. Drop ship lines do not use the pick release, ship confirm or inv interface order cycles. Q12. Can we cancel drop shipment after it is received? A: Drop shipments cannot be cancelled once Oracle Purchasing obtains the receipt. A user who wants to cancel a drop ship sales order line must ensure no receipts have been created against the line and that the requisition and/or purchase order associated with the line is cancelled. Cancellation of a Partial Drop Ship receipt is allowable. But only the portion that has not been received can be cancelled. If you cancel a drop shipment line for which you have not shipped the entire quantity, the order processing splits the line. The first line contains the quantity shipped and the second line contains the non-shipped quantity in backorder. You can cancel the second line the backorder on the sales order. The PO line quantity should be changed to reflect the new quantity. Q13. What debugging tools are available for Drop shipments? A: 1. Diagnostic scripts can be used for troubleshooting problems with sales orders. -Then go to Sys Admin: Concurrent: Program: Define; query up the Receiving Transaction Processor and check the Enable Trace box. -Save the receipt for the deliver transaction (destination type will say Inventory for the deliver transaction). -View the Receiving Transaction Processor log file, the Inventory Transaction Worker log file, as well as, the trace for the errors. Q14. What is the Import source and status of PO generated from Drop Shipment? A: Import source is Order Entry. Status of PO will always be Approved.